In a food processor, whizz 200g of the salmon, then add the crème fraîche and cream cheese. Scoop into a bowl and fold in 2 tbsp lemon juice, a pinch of salt, pepper and the fennel, if using. Very lightly oil 8 x 100ml moulds or ramekins and line with the remaining slices of smoked salmon, allowing them to hang over the edges. Spoon the pâté between the moulds or ramekins and fold the salmon over to cover. Cover with cling film and chill for 2 hours or overnight. Mix the remaining lemon juice, the olive oil and sugar together. Divide the cucumber between plates. Turn the terrines out on the cucumber and garnish each with a dill sprig. Sprinkle the cucumber with the chopped dill and spoon over the dressing. 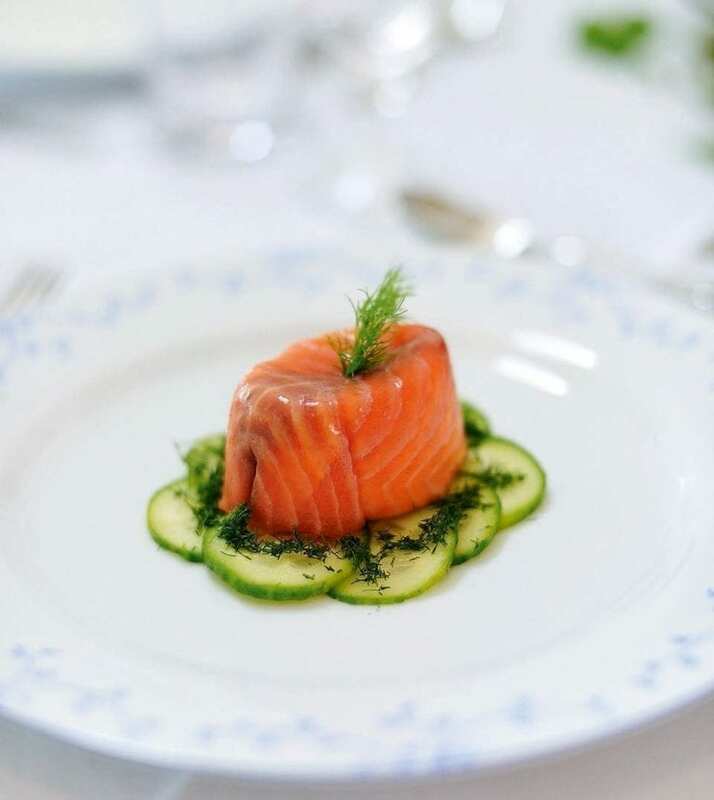 You can freeze the salmon terrines but not the cucumber and dressing. Cover tightly with clingfilm and freeze until ready to use. Defrost in the fridge fully before serving. Our friends at Majestic Wine recommend Chablis Elodie Dupres. Crisp, elegant and with mouth-watering acidity, Chablis is always an impressive dinner party guest, and the ideal partner with that most Christmassy of ingredients – smoked salmon. These are so easy, I always have some in the freezer. Every one is always impressed .